Over a few years, the popularity of her dishes outgrew her home oven and she opened up a Southern-style buffet restaurant that got rave reviews. She authored books, appeared on many television programs, and ultimately wound up endorsing a line of cookware. While Paula Deen was immensely popular in the early 2010’s, in 2013 she came under fire for her alleged use of racial slurs. Deen’s response to the incident was unique: she admitted that she was an old southern woman and that she had grown up in a racist culture. Her authentic response caused a surge in the sales of her cookbooks, even as her television shows were canceled. Deen’s famously unhealthy cooking is just as southern and authentic as her personality. But how does her cookware hold up? Let’s examine some of the more popular lines in order to see if Paula Deen’s cookware is worth choosing over other brands. 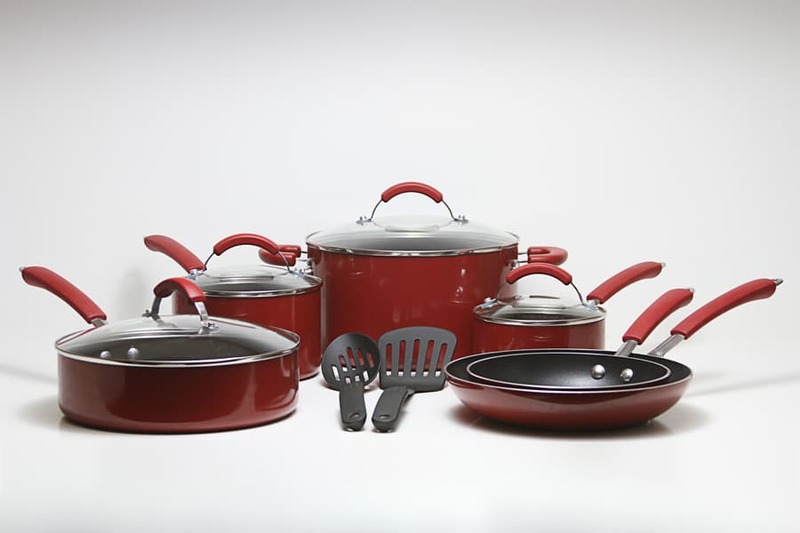 Any review of Paula Deen’s pots and pans should start off by mentioning that these products are vibrant, pretty, and available in a wide range of colors. While it’s not a huge selling point to the practically-minded, any Paula Deen pot, pan, or cookware set can be found in a smorgasbord of specked porcelain finishes. This particular set comes in aqua, butter, blueberry, coral (reddish orange), lavender, and red. Beyond this finish, however, there’s nothing particularly traditional or remarkable about the Paula Deen pieces I’ve tried. The enameled exterior makes them look simultaneously clean and homey, but it does nothing to improve the performance of these pots and pans on the stove. They’re not bad, of course. Instead, they’re simply your standard non-stick aluminum fare. What does this mean? For one, it means that these pots and pans are fairly light. Aluminum is much lighter than steel, meaning that even with the bulky rubberized handles and the glossy porcelain outside of these pots and pans you’ll have no trouble whipping them around the kitchen. They feel quite light. Additionally, it means that they have great thermal conductivity. This is a big word that means that they heat up really quickly. Imagine putting a potholder on top of a hot pan and then placing your hand on top of it. Now replace the potholder with a piece of metal. The metal will heat up quickly and transfer heat to your hand, while the potholder will stay cool for a long time. This is because metal is more thermally conductive than most other materials, and aluminum has especially good thermal conductivity as far as metals go. In terms of cooking, this means these pots and pans will heat up quickly and evenly, helping you boil water and control the temperature of your dishes. Finally, these pots and pans do NOT work on induction ranges. You’ll want to choose a different line if you’d like to use your cookware on a fancy magnetic cooktop. I mentioned earlier that this Paula Deen set was “standard” non-stick aluminum fare. What this means is that you can find lots of other cookware brands that offer pretty similar cookware, at least as far as basic construction goes. 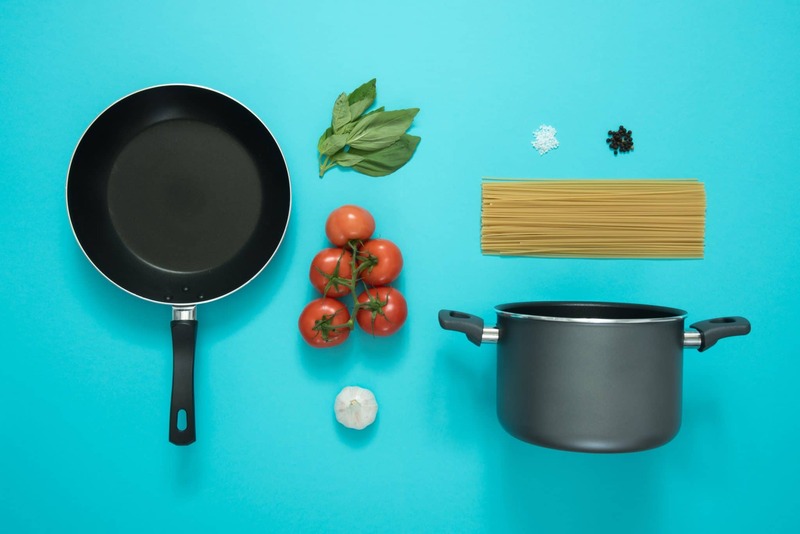 While there are certainly differences in design, durability, and other factors, all of these cookware sets share two big things in common: the aluminum construction gives them pretty good performance on the stove, while the non-stick interior means that they won’t last very long. This brings me to my next point: non-stick does not last forever. Paula Deen’s cookware uses genuine Teflon, which is sometimes called PTFE. While this modern coating is totally free of toxic chemicals like PFOA, it has the important downside of being fragile. Even if you’re careful in how you use and clean these pots and pans, your non-stick coating will begin to flake or scratch off after a couple years. I can’t tell you how long that will take, but user reports seem to suggest that this particular flavor of Teflon is on the less durable end. I’d plan for two to three years of normal use. I don’t want to mislead you here: while two years is a bit short for the lifespan of a modern non-stick pot or pan, it’s not totally unreasonable. I wouldn’t expect even the best, most durable non-stick pan to last for more than 5 years, and that’s with near-perfect care. Paula Deen’s cookware is fairly inexpensive, so it’s not that big of a deal to replace it after a couple years of everyday kitchen use. To be clear, I’m still a big fan of non-stick. The Teflon coating on these pots and pans is incredibly effective at providing a slippery non-stick surface for your food. If you’re a lazy cook (like me), this is essential to getting your eggs right the first time and ensuring that your other dishes can be cooked with a minimum amount of worry and effort. You don’t have to season these pans, use the right amount of grease, or cook at the right temperature to keep your food from sticking. You can flip whatever’s in the pan at any time or temperature without any effort at all. All you need is a Teflon-safe spatula. So should you choose Paula Deen over brands like Tools Of The Trade or other chef-endorsed lines like Guy Fieri’s pots and pans? 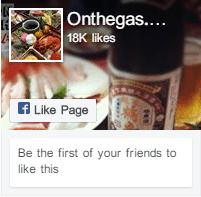 Personally, I think it comes down to taste. While Paula Deen’s cookware isn’t particularly robust, it’s quite pretty and very cheap. There’s not a lot of risk to purchasing a set to try out for a few months. 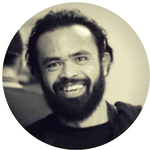 If you don’t like it, you can get something more durable and permanent in a year or two. In the meantime, you’ll have a very attractive set of functional cookware that you can use for all of your favorite dishes, southern or otherwise. As far as the big details are concerned, this cookware set is identical to the one above. 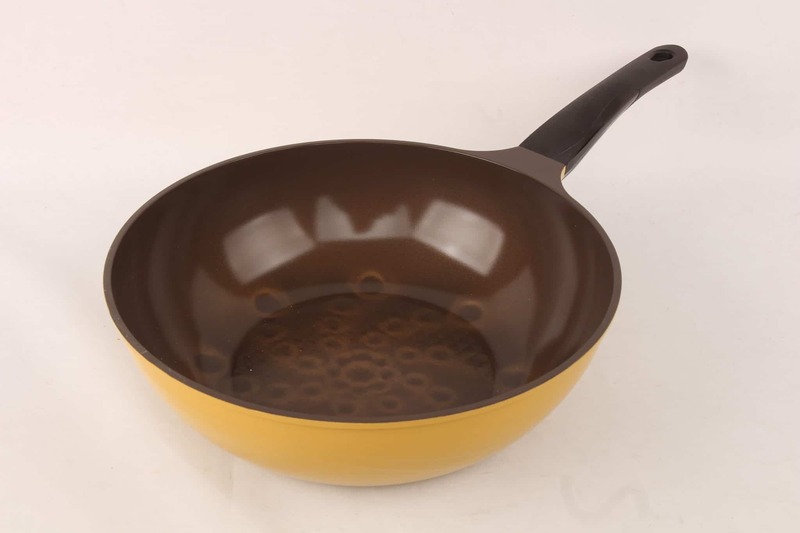 It’s still available in plenty of interesting colors and it shares all of the important construction details: it’s enameled aluminum with a Teflon interior, rubberized handles, and glass lids. The big difference here is what you get in the set. While the set above is a 15-piece set instead of a 12, it’s actually not as large as you might think. This is because it’s got 10 pieces of cookware (2 frying pans, a covered saute pan, two saucepans, and a stockpot, with the 4 lids counting as 4 pieces) and 5 measuring spoons. This 12 piece set has the same 10 pieces of cookware and two Teflon-safe utensils: a spatula and a slotted spoon. This means that it’s a good idea to check the prices on both sets in the colors you prefer. It’s pretty easy to add either a silicone spatula or a few measuring spoons to your online order. By choosing the cookware set that’s cheaper, you can usually save a few dollars even after purchasing any accessories separately. If you’re after an inexpensive non-stick Paula Deen cookware set with a bit of flair, this 12-piece set might offer slightly better value than the 15-piece set above. Be sure to check both options to find the color and price that’s right for your kitchen. If you want something a bit more robust, Paula Deen has endorsed a number of porcelain-coated cookware components that are a bit different than the non-stick aluminum products above. This heavy-duty 12-quart stockpot is made of enameled steel. This gives it an easy-to-clean interior that’s fairly non-stick that also won’t chip, flake, or become less effective over time. Of course, “fairly” non-stick doesn’t actually hold a candle to real Teflon. You’ll definitely notice a difference between this traditional pot and the more modern stuff when it comes to cleaning up after sticky foods. The downside of this pot is that it’s not particularly thermally conductive. Sure, it’s very durable and does an excellent job of holding in heat after you’ve turned off the stove, but that doesn’t mean it heats up quickly or responds to changes in temperature. While this pot is perfect for simmering a stew or chili at a not-very-precise temperature for a few hours, it’s not very good at quickly boiling water or at hitting a precise temperature for specialty cooking tasks. Two upsides I haven’t mentioned yet: first, this pot is induction compatible, and due to the way induction cooking works, it’ll heat up fairly quickly on a magnetic range. Two, and perhaps most importantly, it’s got a wonderfully painted exterior with a wonderful design that won’t be out of place in most homes. You’ll enjoy cooking in this beautiful pot and using it to serve food to your dinner guests. Before I give my closing thoughts, I’d like to mention that some customer reports mention quality assurance issues with these pots. You may want to write down the warranty information while you order in case your pot arrives damaged. This doesn’t seem like a terribly common occurrence, and you should have no problems getting Paula Deen or Amazon to issue a replacement, but you should make sure you understand your options and that you have a plan in case things go wrong. So should you buy this Paula Deen pot? 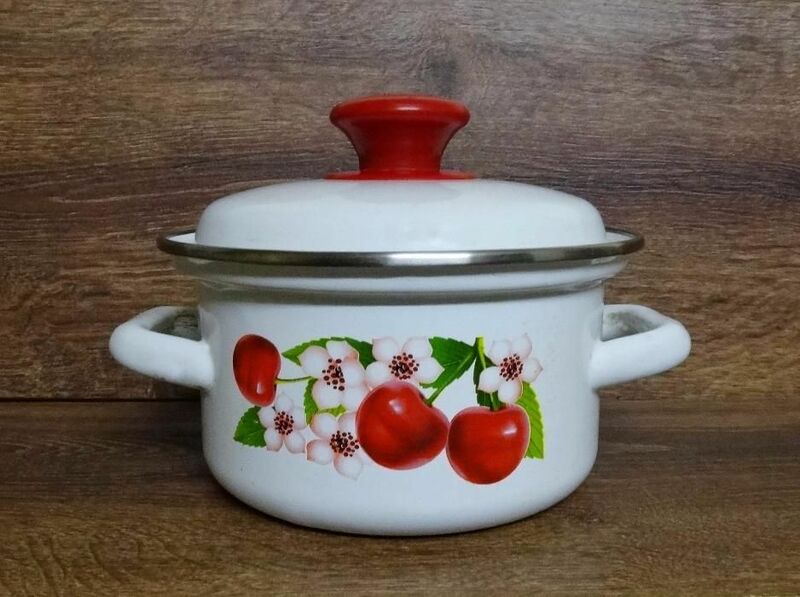 If you want a beautiful, homestyle enameled stockpot, yes. The experience of cooking various dishes in a traditional ceramic pot like this one is a bit different from the experience of cooking the same dish in a boring old stainless steel vessel. You might not taste a difference, but you’ll have more fun in the kitchen and you’ll get to show off a stylish piece of cookware to anyone who happens to wander into your kitchen. It’s also worth noting that Paula Deen sells similar cooking vessels in a few different sizes. Be sure to check out all of your options to find the porcelain pot that’s right for you! Paula Deen is famous for her traditional southern dishes. If you’d like to take the fullest advantage of her knowledge, the best way is by purchasing one of her many southern cookbooks. This Southern Cooking Bible is perhaps the single best option for exploring Paula’s signature style. 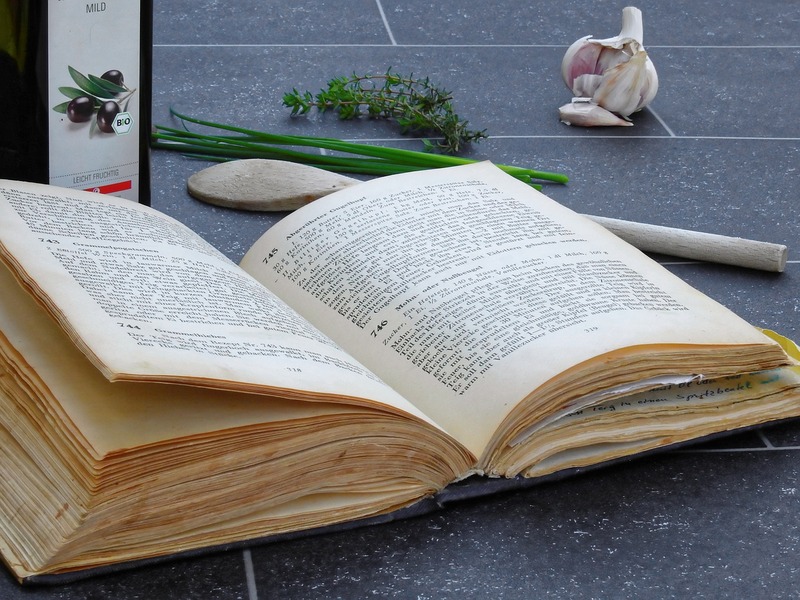 It’s got 300 recipes with plenty of stories, history, and more. That said, this isn’t the healthiest cookbook. If you want something a bit lighter, try Paula Deen Cuts The Fat here. Personally, I’m a bigger fan of the traditional stuff. There’s nothing wrong with indulging yourself with an “unhealthy” meal every once in a while as long as your overall diet stays safe and healthy. Paula Deen Cookware: Worth It Or Not? Paula Deen endorses two primary styles of pots and pans. The first involves an aluminum core, a speckled porcelain exterior, and a Teflon non-stick interior. While these pots and pans are pretty, they don’t last very long. Still, they’re quite easy to clean, you can cook anything you want in them, and you won’t feel bad about chipping the porcelain. You’ll have to replace them in a year or two anyway. Since these pots and pans are quite cheap, I think they’re a pretty solid purchase if you fancy the style. The second style involves heavy porcelain pots with a steel core. These pots have an enameled interior, making them less non-stick than a Teflon pot or pan. While they’re much more durable, they’re also somewhat prone to chipping if you’re not careful with how you use and store them. This is a much bigger deal since the pots can last basically forever if you manage not to chip the porcelain. While these pots are more durable, they’re not suited for everyday cooking tasks. Instead, they’re best for slow cooking things like stews and chilis. They do a great job of retaining heat and have incredibly pretty painted exteriors that look great on display. If you find yourself doing a lot of slow cooking or you want a pot that doubles as an art piece, this style of cookware is absolutely worth it. If you’re not that big on aesthetics, however, be sure to check out other options like T-Fal, Tools of the Trade, and Kirkland’s cookware line. Paula Deen’s specialty here is looks, so your other options may be cheaper, more effective, or both. They just won’t be as pretty.